SCORING CATCH - Shadow Creek wide receiver Jared Jackson (15) crosses the goal line against Georgetown for a score to help the Sharks to a 36-7 win to remain undefeated on the season at 13-0. Jackson had two catches for 56 yards and two TDs. PEARLAND SHADOW CREEK— As they have done all season, the 13-0 Shadow Creek Sharks continued their perfect journey in their first varsity football season with a convincing 36-7 win over the Georgetown Eagles (9-4) in the Class 5A Region III Div. I semifinals. The Sharks advance to the 5A Region III Div. I finals against district foe Richmond Foster who the Sharks rallied for a 35-34 win in their head-to-head thriller in district play. Foster (9-4) is coming off a 41-31 win over the previously unbeaten Hutton Hippos (12-1) to advance to the region championship game. Despite multiple penalties throughout the game on both teams, Shadow Creek was still able to emerge with a 14-0 halftime lead. 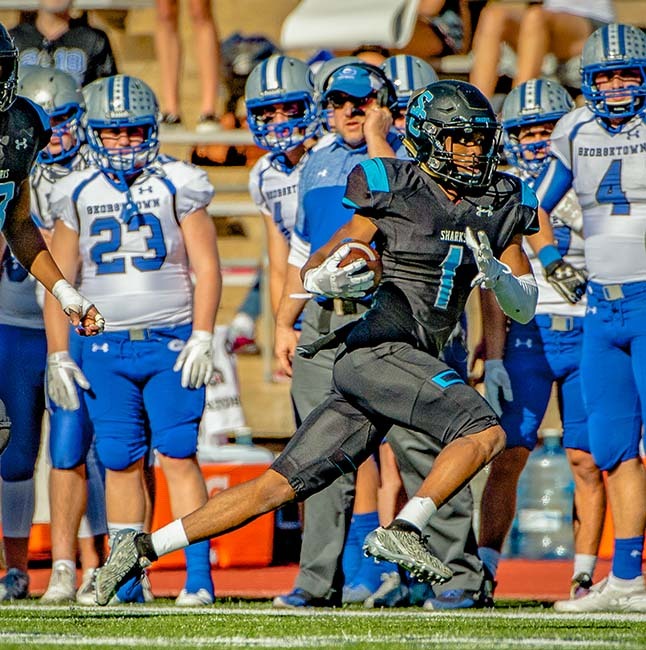 The Sharks opened the game with a strong drive only to see it come to a halt at the Georgetown eight-yard line and faced with a 25-yard field goal attempt that missed the mark leaving the game scoreless in the opening quarter. 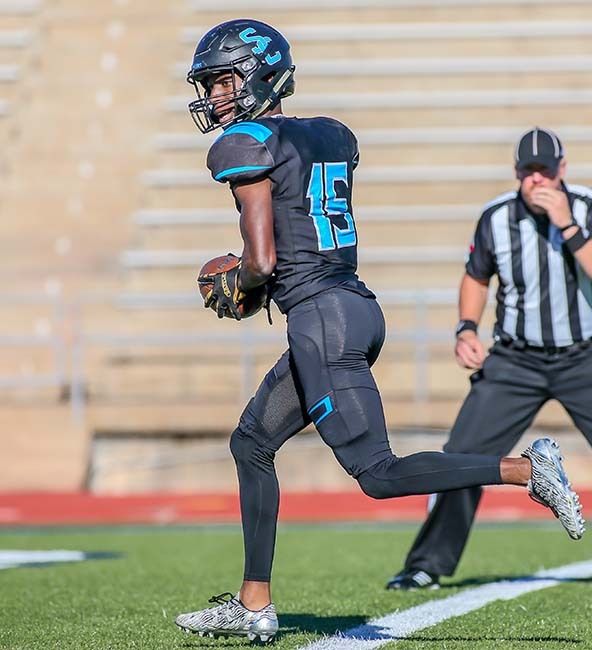 TOUCHDOWN - Shadow Creek wide receiver Kealon Jackson (1) caught a 25-yard pass from QB Jamarian George and turned it into a touchdown against Georgetown in the Class 5A Region III Div. I semifinals. While the Shadow Creek defense held their own against the Eagles, the Sharks finally were able to find the pay station when quarterback Jamarian George skirted in for an 11-yard scoring run to make the score 7-0 following the PAT by Greg Ezechukwu. The Sharks added their second score of the game with about nine minutes left in the second period when George fired a 25-yard scoring strike to Kealon Jackson for the 14-0 lead that stood at the end of the first half. Shadow Creek began to blow the game open as they scored twice in the third quarter. Both scores came on touchdown passes from George to Jared Jackson who snagged scoring strikes covering 29 and 27 yards to give the Sharks a 28-0 cushion. The Sharks defense added to the scoring column when they got a two-point safety on a poor punt snap by Georgetown that found the end zone giving Shadow Creek a 30-0 lead. With under a minute left in the third, Georgetown finally found the Shadow Creek end zone to cut the lead to 30-7. With the game safely in hand, Shadow Creek scored an insurance touchdown on a 32-yard pass from George to Greg Hancock to post the 36-7 final score following a missed PAT. George was 12-of-17 passing for 188 yards and four TDs while gaining 21 yards on six carries. Marquez Huland continued to be the workhorse on the ground with 20 carries for 133 yards and he had one reception for 30 yards. Isaiah Harper had nine totes for 66 yards. Kealon Jackson had three grabs for 44 yards and one score. Hancock had one catch for 32 yards and a TD. Jared Jackson had two catches for 56 yards and two TDs.